A range of switches and sensors which can be used with fans within the LinX range including the LinX Series Commercial range. Variable non-reversing speed control is suitable for controlling the speed of single or multiple 6" LinX Series Commercial fans. Can to be used with multiple fans up to a maximum load of 200W. Variable reversing speed control designed for use with 9" & 12" LinX Series Commercial fans. Can be used with multiple fans up to a maximum load of 200W. 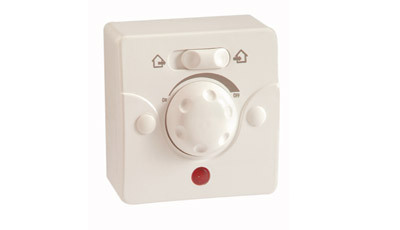 An intelligent passive infra red movement sensor will switch the fan on during occupancy. The unit incorporates a time delay switch - designed to save energy and requires no switched live supply. Range 5 meters. Fits single gang wall box 20mm deep.